The aim of this board is to be a peaceful haven for serious Billy the Kid researchers and enthusiasts who do not want to be bothered or harassed by the usual drama and negative activity of most message boards. There are no naysayers and troublemakers here. We do not want our discussions to be interrupted by absurd notions, conspiracy theories, and bogus claims. We no longer want historical facts to get drowned out by false information to mislead readers. Enough is enough and the truth must be heard. Members of this board are legitimate and positive contributors, from researchers, historians, authors, to knowledgable aficionados, as well as new, but serious, Billy the Kid enthusiasts who want to learn the facts. This is a place where we come together to converse, debate respectfully, and share information without the chaos of irrational folks disrupting our discussions with arguments and name-calling. There's no wild bogus ideas or conspiracy theories here! We talk history, we seek the facts and dispel the myths and rumors!! 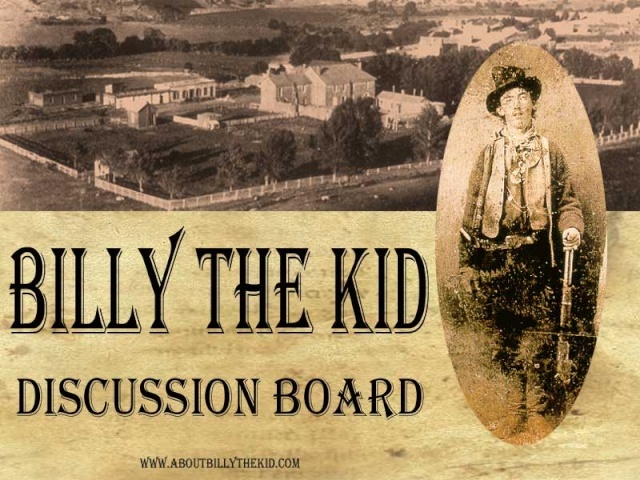 Not only is this board for our own enjoyment, but most of all to educate and correct the misconceptions and lies on the history of Billy the Kid.